Live dealer Blackjack at RedBet Casino is brought to you by Redbet Gaming Ltd which is part of the Bonnier Group AB. Bonnier is a well-respected Swedish firm that has many subsidiaries. Live dealer gambling over the internet has been popular since round about 2007. Blackjack is also popular among players internationally and has fans from across the length and breadth of the world. Redbet is licensed offshore in Valletta, Malta and was founded in 2002 but only came live online in 2004. The company has a simple mission statement “to create a fun, engaging and trustworthy place to play and one where the happiness of our players is always paramount”. This is a full-service casino, partnering with extremely reliable software brands such as Net Entertainment, Ongame, and Microgaming. 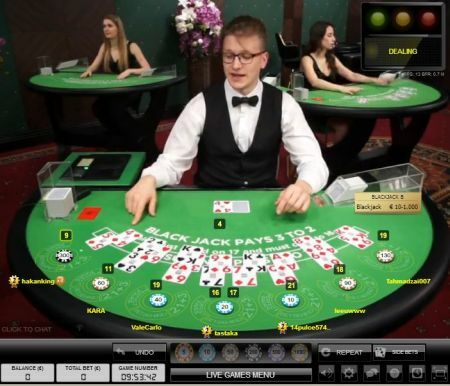 The live-dealer blackjack being powered by Evolution Gaming. The evolution of the Internet has decreed that innovation is King. The knock-on effect of this is that innovative products will nearly always do well. Redbet is an innovative, high-quality product where live Blackjack can be found in “Casino Red”. This offers state-of-the-art, webcam video streaming with adjustable sound, and other features. It is a particularly user-friendly interface, filmed in real time, and with no noticeable delay between games. Tables, and of course the gorgeous croupiers may be viewed in standard mode or full screen, and software may be downloaded or games simply played through the browser. Croupiers as well as being quite enchanting, are also English speaking, adding just the right touch of professionalism to set the scene. These lovely ladies may be conversed with by means of live chat. One of the really nice features of this live dealer environment is that no deposit is required to view Blackjack tables. Many live offerings require registration and a deposit to be made, before these tables may be viewed. Both Blackjack and Roulette are screened from TV-type studios based in Malta, whereas we mentioned previously, the casino is licensed. A whole host of payment/withdrawal methods are present, and various currencies may be applied to your gaming experience. VIP tables are also on offer which makes a big difference to table limits. This is particularly so for Blackjack, which allows the high roller to enjoy an “own” specified form of these games. Blackjack limits normally range from between £5 and £2,000 per hand. No free or demo-mode games are allowed in any form of live-dealer blackjack, however, the beauty of playing this game online is that free online games can be found at Redbet where newbies can practice their hand at landing 21.